This is a Hand Signed Black and White 5.75" x 4" Publicity photograph by the English television, stage actress and presenter. Amanda Louise Holden (born 16 February 1971) is a British actress and presenter. 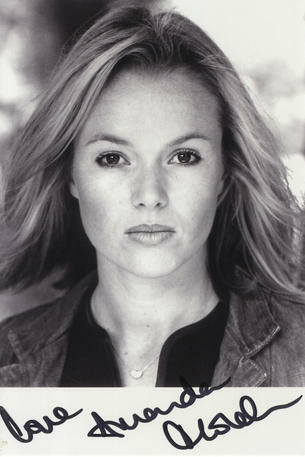 Among her roles are Mia Bevan in Cutting It, Sarah Trevanion in Wild at Heart, and the title role in Thoroughly Modern Millie, for which she was nominated for a Laurence Olivier Theatre Award. Since 2007, Holden has been a judge on Britain's Got Talent.